Ordinary number signatures Weerapong-Chawalit 7 digits UNC about 70 - 75 baht. Ordinary number signatures Sutee-Wijit 7 digits UNC about 50 - 55 baht. Solid number set 1's - 9's 9 notes) signatures Sommai-Kamjorn UNC about 75,000 baht. 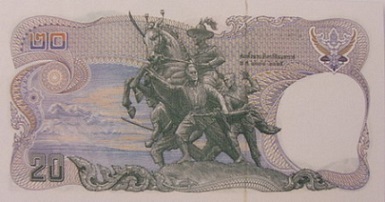 The printing of banknotes, 12th Series, was intended to glorify Thai monarchs in history who have been honored with the title "the great". Their monuments were printed on the back of the banknotes. 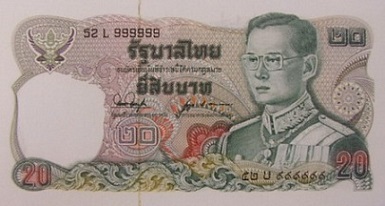 This 20 baht banknote was issued on December 28th, 1981. The main color of the banknote is green. The main object is the image of King Rama 9 in the uniform of the Supreme Commander. The main object is the image of the equestrian statue of King Taksin at Toongnachei Park Chantaburi.